The allmedic range is formulated for clinicians / physicians and is driven by solutions and results. 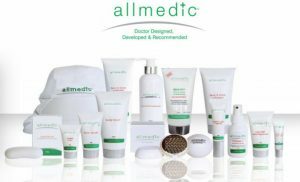 To view a full list of the products please click the link below or call one of our trained medical skin care experts on 1300 652 969.
allmedic is an Australian Skin Health company founded and operated by medical doctors who specialise and practice in the fields of skin cancer, medical cosmetology, molecular immunology, and skin allergies. The result offers a medically researched solution for improving your skin’s health via a range of skin protection and treatment products and devices.